When Southgate station was built it was in a rural setting with a horse trough in front! I think the light pylons were added in the very late stages of construction and the horse trough removed just before it was officially opened. Those alterations were done to conform to the new road layout around the station area, which is now known as Southgate Circus. Despite claims the circus has recently been restored to a more original look, its not exactly as it was planned in the 1930s. The station buildings are Grade II* listed (having been upgraded from Grade II in 2009.) The areas immediately outside the station have seen the original landscaping layout from the 1930s partially restored. Desite being built at the same time, the bus station and shopping parades are not currently listed although the council proposes this be changed. The bus station and parade. There are many issues which the council believes spoils the overall character of the unique station. 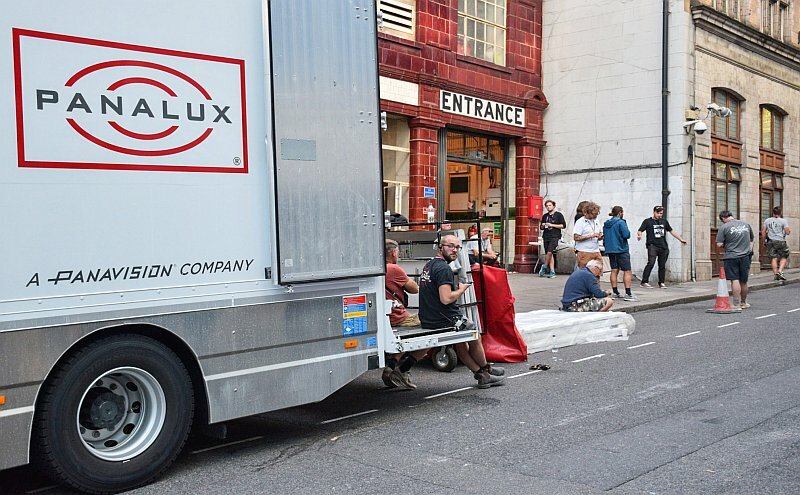 These include poorly sited street furniture, badly maintained shop units and arcades, advertising that detracts from the overall site character, wrong types of windows used when the old ones get replaced and so on. The council believes more restoration of the original 1930s street lamps, street furniture and other features would help to make the overall area more aesthetically pleasing. Tube station, bus station, a bus, classic lamp posts and the clock! It has been claimed Southgate bus station is the only one designed by Charles Holden. I dont think that is necessarily accurate for Turnpike Lane also had a Holden bus station and even Cockfosters sports one that complements its semi-rural surroundings, far in excess of the simple interchanges provided at Holden’s other stations, say South Harrow. 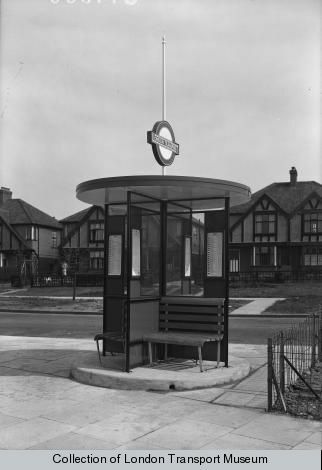 Holden clearly wanted to make interchanges with local bus services an essential part of his designs, but at both Turnpike Lane and Southgate he had the land available to expand his ideas further and these two locations sport proper bus stations. Cockfosters has a sort of in-between, a transport interchange with extra facilities, shelters and proper bus stands. But there’s far more to that terminus as we will see in another post soon. Station Parade & 1930s style lamp post. Some of you may recognise these lamp posts also being used at Sudbury Town and so the concept dates from possibly late 1930/early 1931. There is a difference though. The ones at Southgate are possibly original whilst those at Sudbury Town are said to be modern replacements according to Historic England. This need to be checked as Sudbury Town has three distinct types of lamp post design. One style was used for Southgate, presumably the most aesthetically pleasing of the three, whereas Oakwood acquired the second variation of these. The rear of the shopping parade on Crown Lane, Southgate, with its huge roundel. The passageway from Crown Lane leading directly to the station, note curved windows and styles of lighting. A different style of lamp shade in the Parade. The Southgate station pylons, or light towers as the tube call them, initially look alike however they are very different. The northern one is somewhat smaller in girth compared to the southern pylon. and its the only example of four built (others at Oakwood and Turnpike Lane) that has a marble like embellishment on the pillar above the seating. Sadly the full impact these days of the appearance of the station at Southgate and its pylons/light towers is somewhat marred by the everyday street furniture we have come to expect on our high streets. Who designed these fantastic station pylons? Historic England has this to say of these pylons: “They were erected in 1933 to the designs of Stanley A. Heaps for the London Passenger Transport Board, based on a design by Charles Holden…” From this it seems the cicular bus shelter designed by Holden in the 1920’s was used and Heaps developed these further to produce the final designs for the stations on the new Southgate extension. 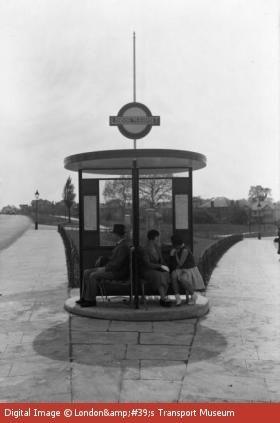 These shelters are sited in South London, and possibly related to the new bus routes linking to Morden station, opened 1924. A square type was also designed by Holden, and an adapted version of this used at some tube stations. Stanley Heaps clearly added a much larger central pole that doubled as a light tower, circular seating and a huge roundel. The northern pylon (that facing Chase Side) is apparently original whilst the southern one (opposite The Bourne) has been rebuilt. None of these had seats at least for the first few months of station opening. Seats were added somewhat later. Beyond the station the tube itself is in a very short section of tunnel leading out onto the Southgate viaduct, the second major such structre on the line. The tunnel mouths north of Southgate station. 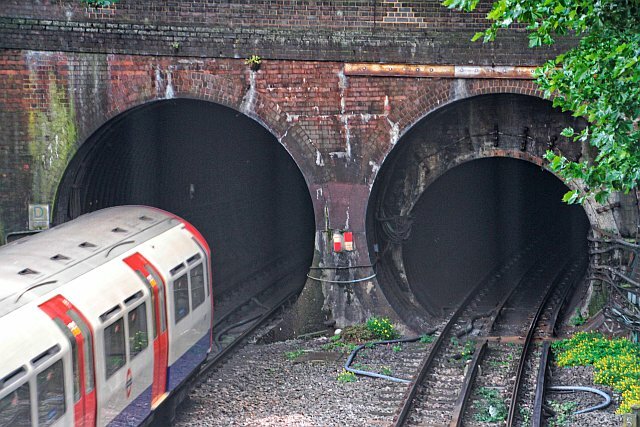 The full sized tunnel portals are evident. Heathrow bound 73 tube stock at Park Road, Southgate. Southgate viaduct doesn’t have magic numbers like the huge viaduct at Arnos Park to tell us how many there are. Its nineteen, with that over Mayfair Terrace (and the local stream – the Houndesden Gutter) being the eleventh going north and the largest of the lot. Below: Southgate Viaduct under construction – the first description from Getty’s is wrong, should be 1932! General view of Southgate viaduct from Mayfair Terrace. When the line was first opened the viaduct passed through countryside and what an imposing sight it must have been! 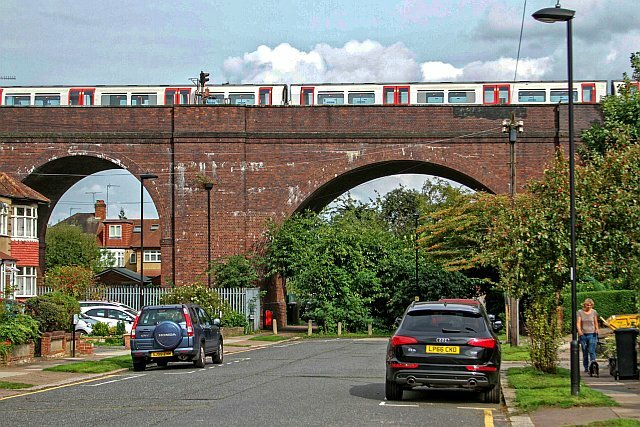 The houses that now surround the viaduct would not be built for a few more years. Passenger’s eye view looking over Mayfair Terrace and Chase Side. The area’s hilly nature is apparent. Mention must be made of the signals on Southgate Viaduct. From certain viewpoints its almost as if each signal is kissing each other. Else they are almost on top of each other. 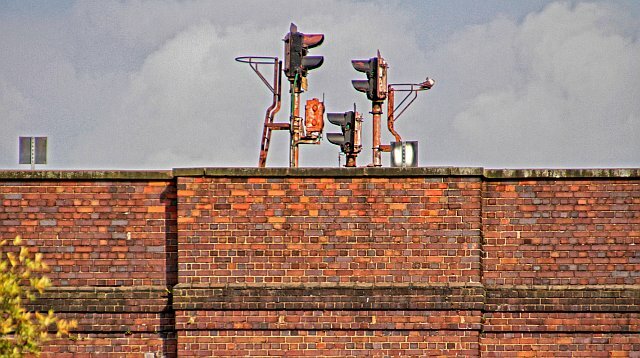 Its in many ways an evocative reminder of the group of three colour light signals on the Chiltern main line at Dollis Hill, where the first was one that did not work, with another right behind that was too a dud, and a third, taller than the first two and which at least did work. A classic sight from the front seats of the old pressed steel DMU’s! The quite confusing signals on Southgate viaduct. A bridge number plate at the base of the Southgate viaduct. The very nice speckled effect is probably because paint has been added straight on the top of the rusty plate! Beyond Southgate viaduct the line continues through a mix of hillside/cutting stretches towards Oakwood, the land mostly falling away to the east.